I have dry hands. Always have done. I remember being in secondary school and always carrying lip balm and handcream in my rucksack (back in the days!) no matter what. 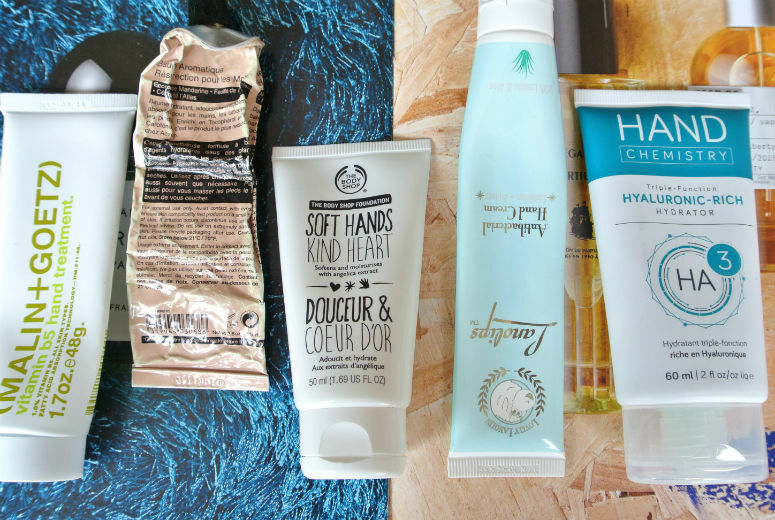 When I started university and began chopping and changing my bags, I would normally have a handcream in every single bag I rotated between, along with one that was permanently sat on my desk. Working in an office has made me no different, and looking at the picture above, the OCD I have about having handcream with me wherever I go doesn't seem like it's leaving me any sooner. The thing is, I'm extremely picky about them, even if I do consider them one of my boring staples. I am particular about smell, texture, and greasiness, which means I've already made the search all that much harder for myself! Malin+Goetz Vitamin B5 Hand Treatment: possibly my favourite of this bunch. With a light almond scent, and a nourishing feeling, without being excessively greasy, this does make my hands feel hydrated. I still leave marks on things if I touch them soon after applying this, so it's still not the ultimate cream, but it's definitely one I've been going back to. Aesop Resurrection Aromatique Hand Cream: One of the greasier options in my list, and also one of the strongest smelling. I definitely left handprints around after using this! Also, the metal tube has a tendency to split at the sides, and I found bits of cream squeezed out over my bag. Not something you want happening when it costs £19 a tube! The Body Shop Soft Hands Kind Heart: I bought this tube on the spur of the moment when I was at the counter, and completely regret it. I am happy that the Body Shop donates £1.50 from sales to their foundation for charity purposes, but it's just not for me. Though the formula is light and fairly non-greasy in comparison to others I have used, I find the smell absolutely vile. It reminds me of a very expensive tuberose candel I bought that gave me a severe headache after five minutes of burning. Having this smell on my hands, wafting around me as I push my hair out of the way etc (I'm amazed how often I have my hands within smelling distance!) just means that this is a no-no and I'll be giving this away to someone instead. Lanolips Antibacterial Hand Cream: if you travel on public transport, then you probably will want to carry one of those antibacterial handwashes that dry while you're rubbing your hands together, and also dry out your skin. Well, why bother carrying that, when you can have something that gets rid of bacteria while also moisturising at the same time? The Lanolips antibacterial cream does just that (I sound a bit like one of those sales channels), with their trademark use of lanolin to protect hands. I think that this is a good one to have during winter, because it's quite thick, but it definitely is the greasiest of them all in this list, so don't use this when you're handling anything fragile! Hand Chemistry Triple-Function Hyaluronic-Rich Hydrator: my newest and wordiest-named handcream. The hyaluonic acid craze has made its way to handcream, which makes sense to me, as it's put in skincare with the aim of retaining moisture. This is a very light handcream, and completley non-greasy, which I find very liberating. It also has a lovely smell, which reminds me of mojitos for some reason! I don't find it as hydrating as my Malin+Goetz cream, but it's still early days, and so far I've been happy keeping this in my handbag. Considering how picky I am about them, I expect my handcream experimenation will carry on, but in the meantime, I'm pretty happy with the Malin+Goetz as well as the Hand Chemistry cream. If I find any others, I'll be sure to add them to the blog.